For the automotive industry, processing transactions quickly and securely is one of the most important parts of the business. When customers need to pay for a service or repair, accepting that payment must be done in an efficient manner. This is even more important for a business like A&T Tire and Wheel. During the busy fall and spring months, when customers are getting their winter tires taken off or put on, the line-up is consistently out the door. Being able to process transactions quickly is what drives good business. Having a fast, reliable terminal with a dependable payment-processing provider at their fingertips is how A&T Tire and Wheel maintains their customer service and customer experience at check out. 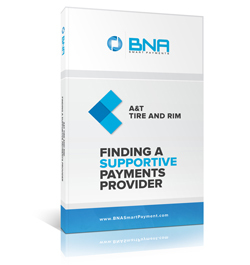 Take a look at what A&T Tire and Wheel had to say about BNA Smart Payments.